The sun is finally making it’s presence known and with the sun comes warmer temperatures. Thank goodness! Something about the impending arrival of summer makes me crave super healthy salads. Maybe it because eating salad makes me think I’ve instantly lost a few pounds, never mind the burger or slice I may eat later in the day they don’t count. I love salads, but a salad is nothing if it’s not dressed up with a good dressing. My favorite kind of dressing is a vinaigrette. They are always light, bright and full of flavor. 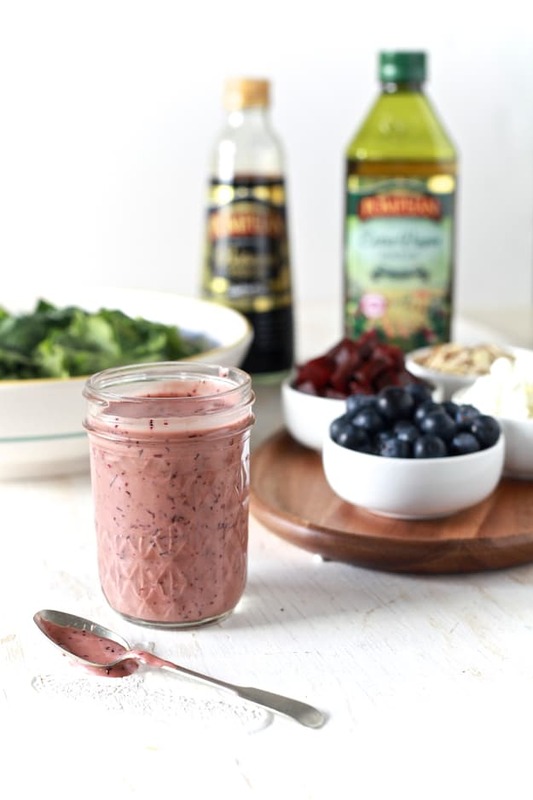 It amazing how simple and easy it is to make a simple vinaigrette. All you need is a good quality vinegar, olive oil and whatever flavor you want to add. With most vinaigrettes, I use a ratio of 1/2 cup olive oil to 3 tablespoons vinegar. Combine everything in a container with a lid and shake it! 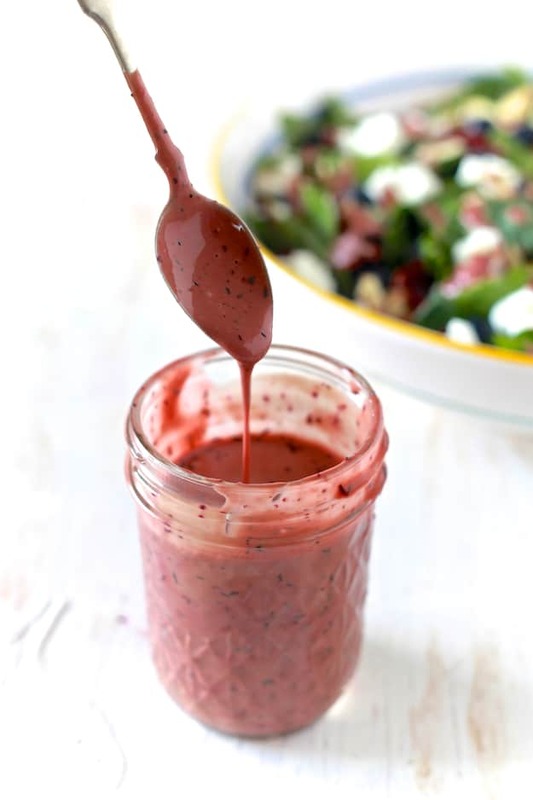 I love to make my own dressing because I can make as much or as little as I need and don’t have to have a collection of bottles take up space in my refrigerator. 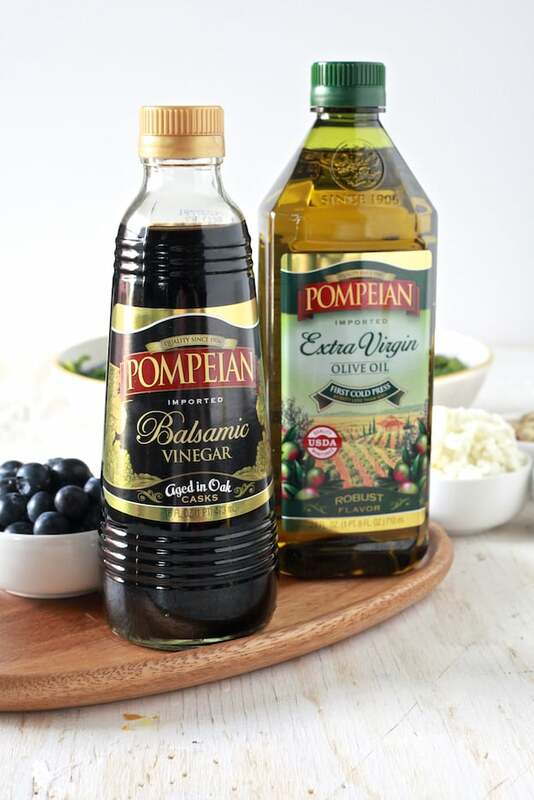 The timing for my current love for salads and homemade vinaigrette couldn’t be more perfect because it’s National Vinegar Month and Pompeian is helping celebrate with their amazing varieties of vinegars. If their is one vinegar that I love above all the rest its balsamic vinegar. It versatility is amazing! It’s rich, dark and full of character and is a taste treasure from the Mediterranean that can be used in salads, meats, seafood and sauces. Reduce it down to a glaze and the sweetness is amplified and perfect to be served over fruit and desserts! Like I said crazy versatile! But, let’s say your crazy and not a fan of balsamic vinegar. It’s cool we can still be friends and Pompeian has got your back because they got all the vinegars! Being that it’s national vinegar month and all I want to eat is salad it’s time to talk salad and dressing it up. 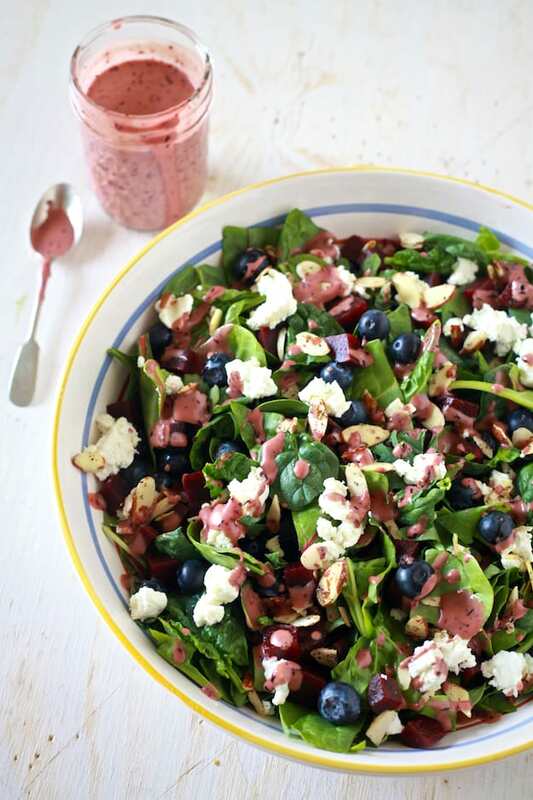 I adore pairing balsamic vinegar with blueberry, add some fresher crack pepper and you have a real winner. Pepper has a way of amplifying the flavor and sweetness of blueberries without being obnoxiously peppery. It’s kind of magical. 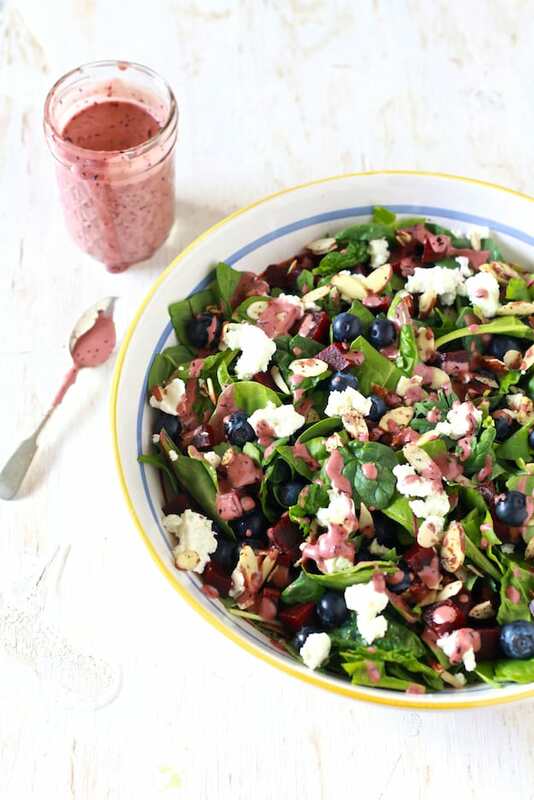 I wanted a hearty salad with a little bite, so I decided to uses a bed of baby kale and chard topped with fresh blueberries, earthy beats, sea salt and pepper almond slices and tangy goat cheese. I LOVE goat cheese with beets and blueberries. Just writing this is making my mouth water. I’m also starving, but that another issue. What are your favorite salads? Do you make your own dressing and if so what it your favorite go to dressing? 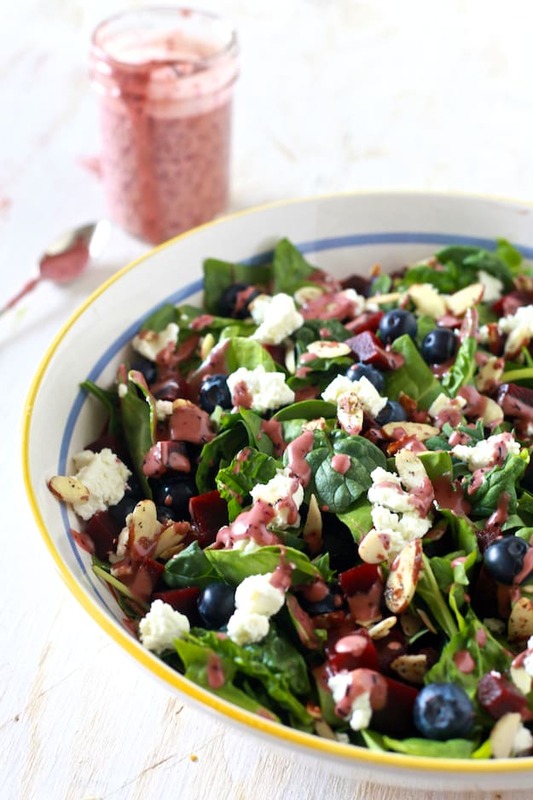 Spring is here and summer is just around the corner, it time to dress it up and munch on some tasty salads. 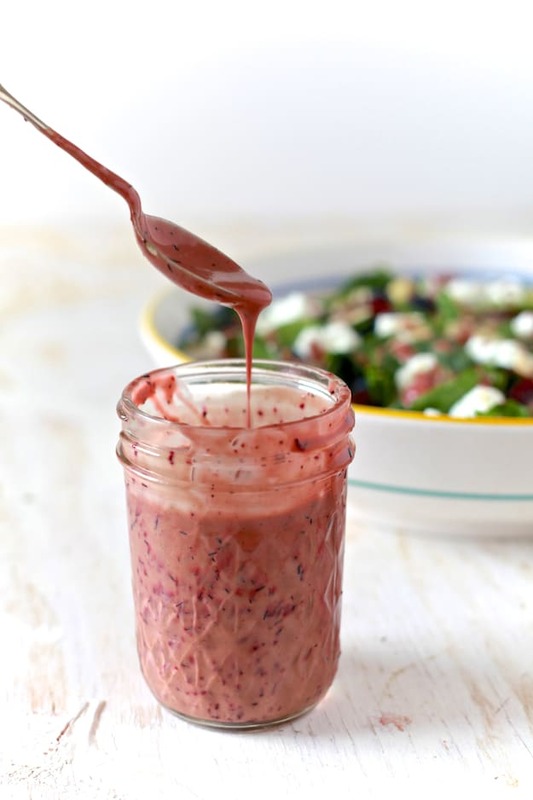 Combine all salad dressing ingredients in a small container with lid and shake until well combined. 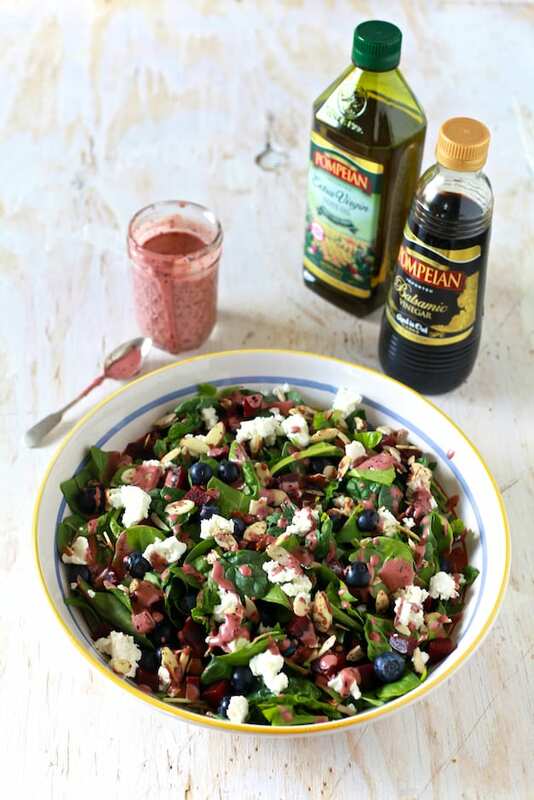 Combine desired amount of salad ingredients in a large bowl, drizzle with desired amount of dressing and toss. 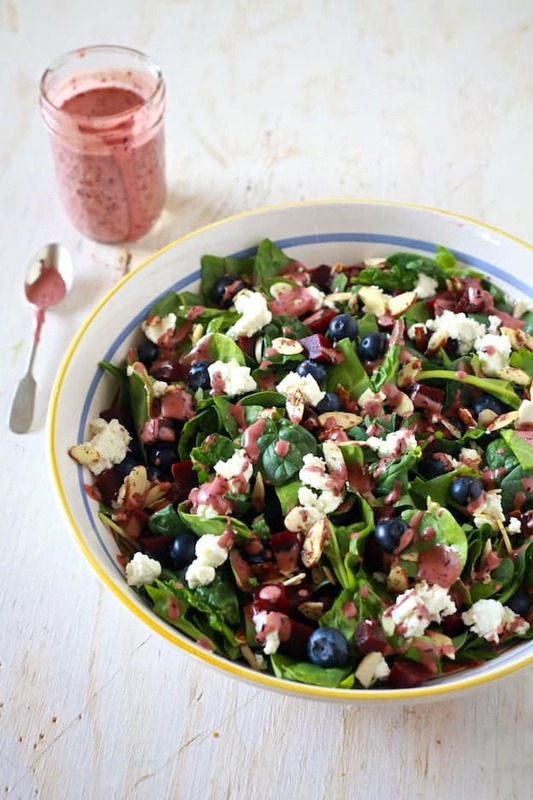 I love wilted spinach salad with bacon, hard-boiled eggs, green onions and a warm dressing made from a little of the bacon drippings mixed with red wine vinegar.